This butterfly life cycle activity is perfect for toddlers, preschoolers and school aged kids that are learning about the stages of a butterfly life cycle! They'll have so much fun exploring the butterfly life cycle while learning about different tree seeds. 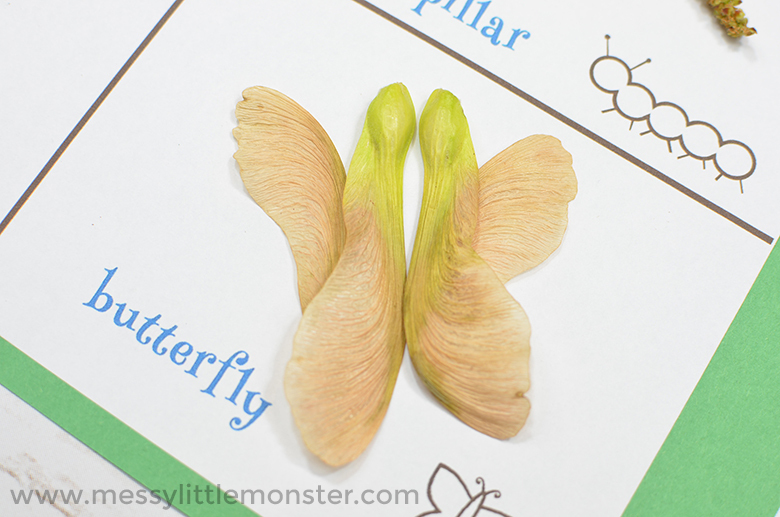 We have included a free lifecycle of a butterfly printable to go along with this fun activity. Just download and print the free printable and follow the step by step instructions below for this butterfly life cycle activity! Kids will love going on a seed scavenger hunt to find all the things that they need for this fun and educational butterfly activity. Are you looking for more fun butterfly activities that the kids will love? Try this butterfly mask craft or this coffee filter butterfly. If you're looking for another activity with a printable toddlers and preschoolers will love this Very Hungry Caterpillar activity! 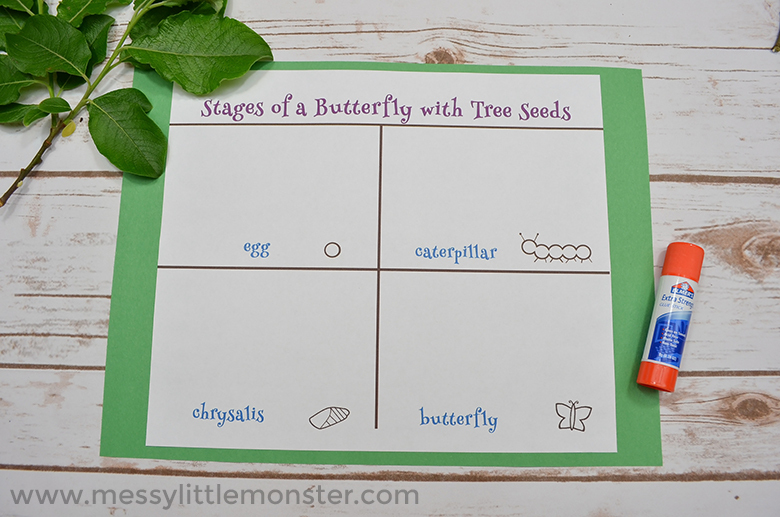 Below you find simple step by step instructions for using our stages of a butterfly printable for this butterfly life cycle activity! This would be a great activity for toddlers and preschoolers who are learning all about nature and butterflies. Bugs and butterflies is such a fun theme for young children, they seem fascinated by it! We have an activity calendar full of 31 fun bug and butterfly activities that you might want to take a look at. 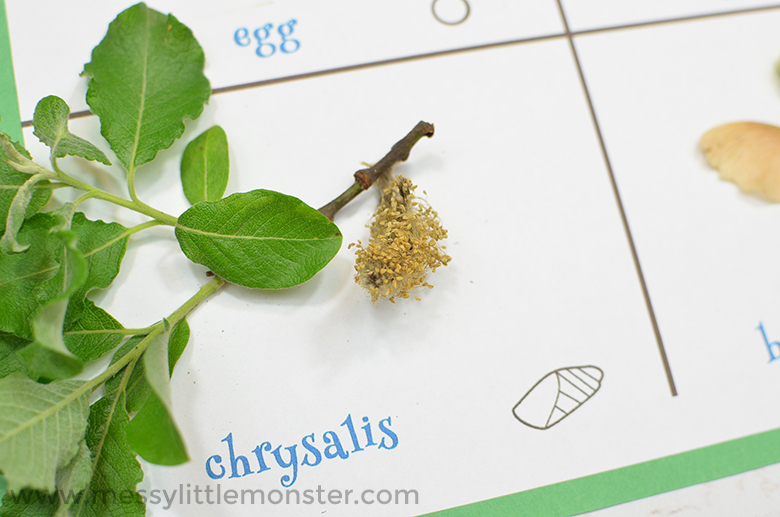 SCROLL DOWN FOR THE BUTTERFLY LIFECYCLE PRINTABLE! First you'll want to download and print your lifecycle of a butterfly printable - you can find it by scrolling down below. Then you need to gather all the supplies (construction paper and glue) that you need to prepare this butterfly life cycle activity. Now that you have all your supplies, it's time to prepare your butterfly life cycle activity! 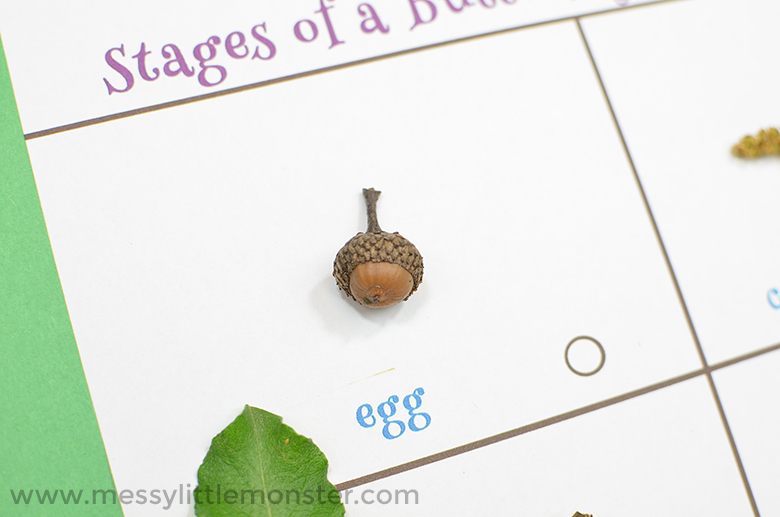 Since this activity involves using tree seeds, we'll want to make sure the printable is nice and sturdy. 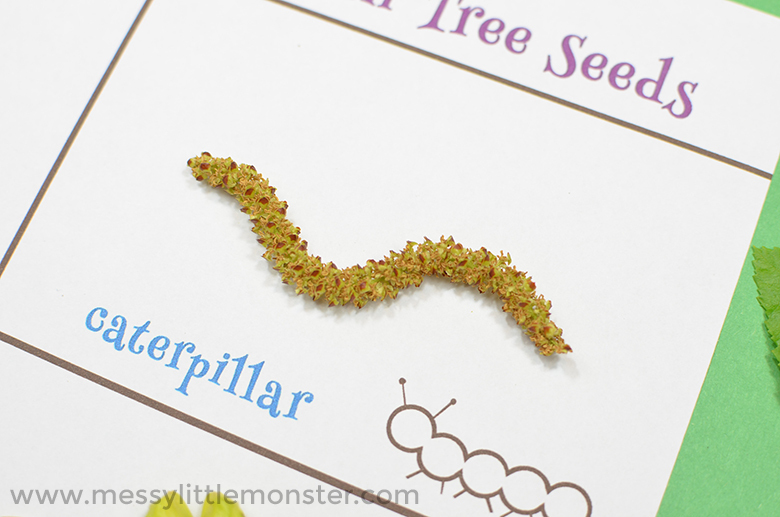 Use the glue stick to adhere the life cycle of a butterfly printable to your construction paper. Make sure to get all the edges so it sticks without coming off! If you are doing this life cycle of a butterfly activity with a toddler or preschooler you might want to prepare the activity in advance, older children can do the glueing themselves. Now is a good time to talk to your child about the stages of a butterfly life cycle. You could look though a butterfly book together or you could even get your own live caterpillars so you can watch as they turn from caterpillars to butterflies. Next is the fun part - the kids are going to love this step! It's time to take your child on a seed scavenger hunt. You're going to look for different tree seeds that look like each butterfly stage. A few examples might be maple seed pods for the butterfly, birch seeds for the caterpillar, and an acorn from an oak tree for the egg. But those are just a few examples! See what your child comes up with! 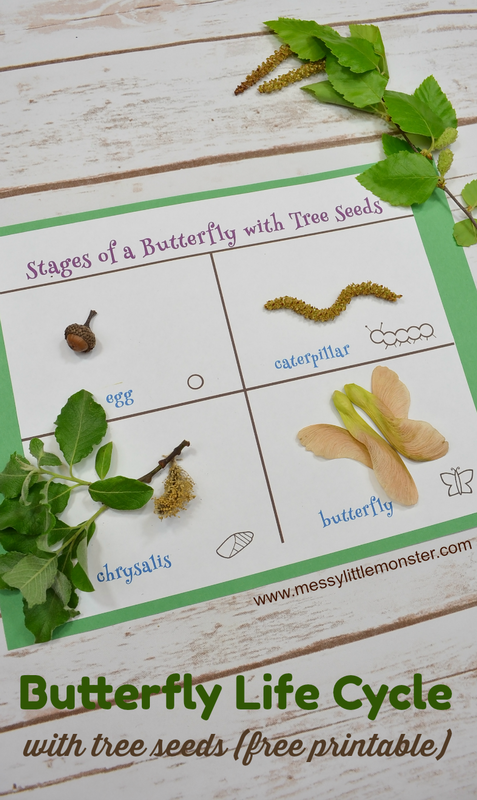 You might want to take a book or a few images of the different stages of a butterfly life cycle with you to help your child find seeds to represent them. 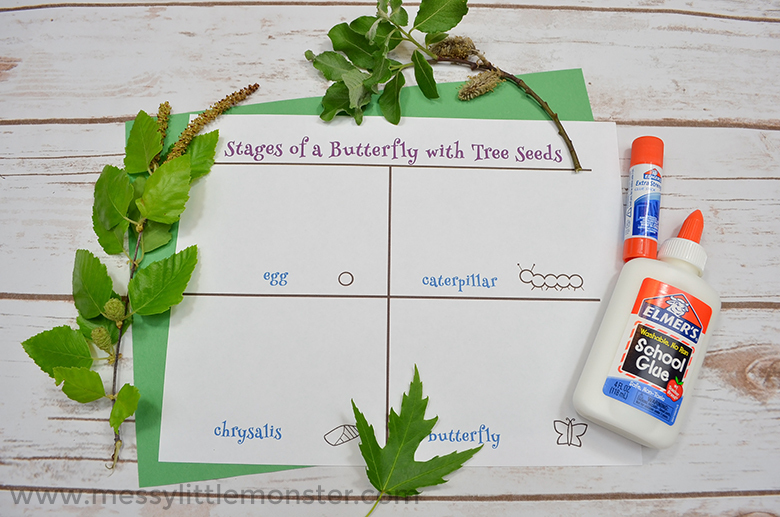 For the last step glue the tree seeds onto your lifecycle of a butterfly printable (toddlers and younger preschoolers may need a little guidance). Then, reflect about the different stages of a butterfly and talk about the tree seeds that you found. 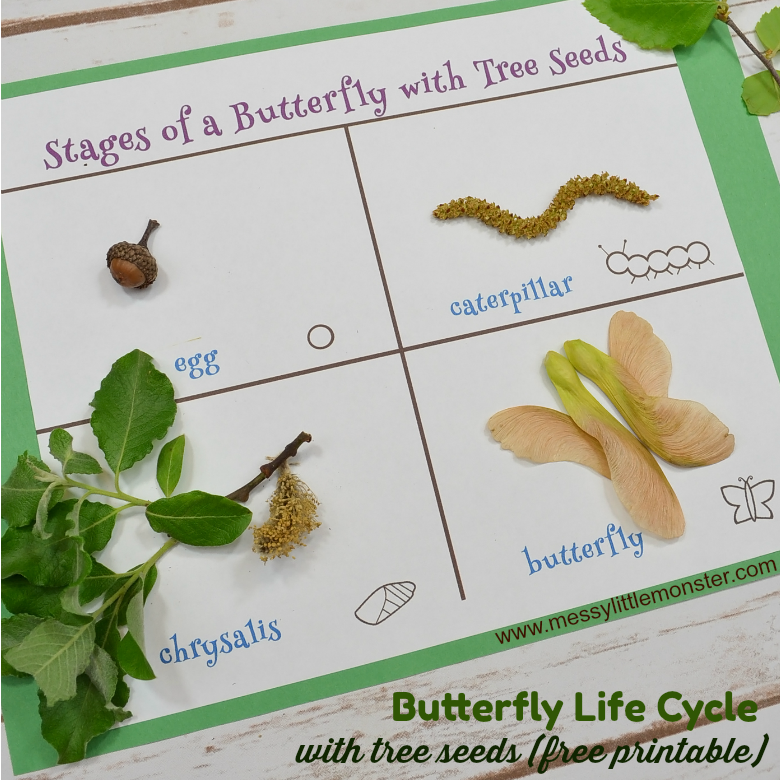 This activity is great for toddlers, preschoolers and school aged children to learn about the stages of a butterfly life cycle and about tree seeds at the same time. They'll have so much fun with this activity that they won't even realise how much they are learning! To download this printable butterfly lifecycle for free add $0 and click on the 'I want this' box below. It may take a moment for the page to load so please be patient. If you enjoyed this butterfly life cycle activity, you'll also love these other fun butterfly activities! The kids might enjoy making this butterfly mask craft and this coffee filter butterfly.They might also like this fun Very Hungry Caterpillar activity! 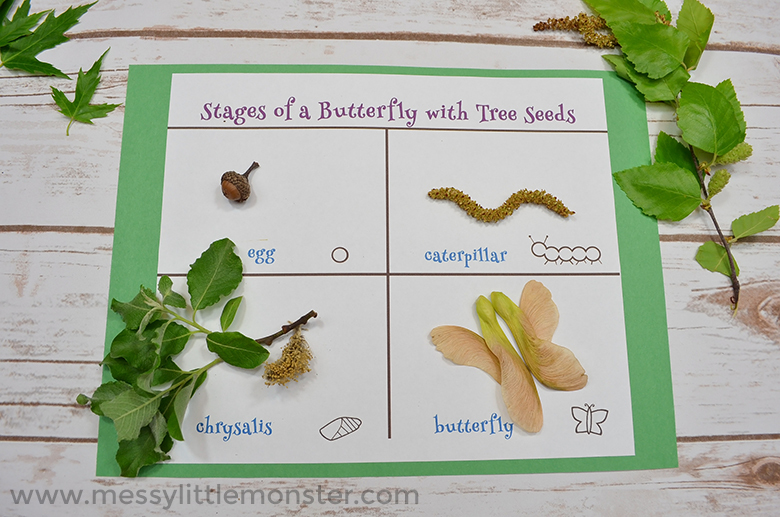 Using the free lifecycle of a butterfly printable and going on a scavenger hunt makes this butterfly activity so easy and fun for even the youngest toddlers and preschoolers. 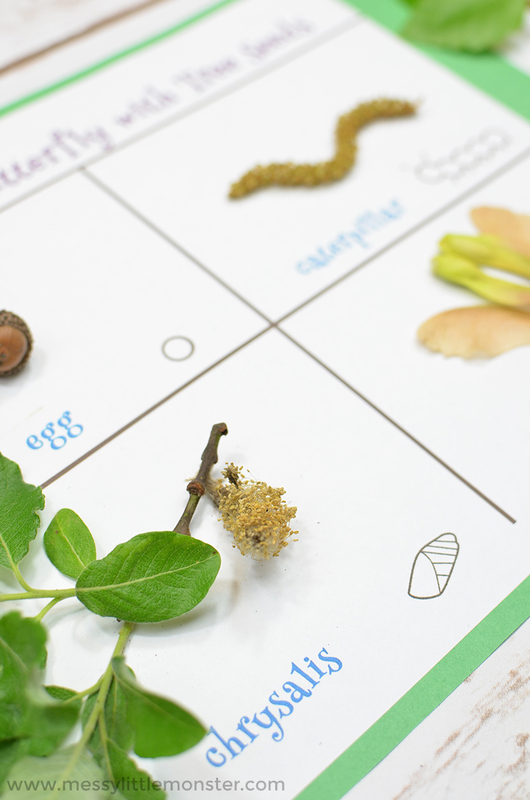 Kids will love learning about both tree seeds and the stages of a butterfly with this butterfly life cycle activity. I love watching young children learn with fun activities like this!